Spurs came to Bloomfield Road fresh from their Champions League excellence, whilst Ian Holloway had ten days to work with his squad since the draw with Aston Villa. Both managers faced selection dilemmas due to injuries to key personnel. However, it was the in-game changes that held the key to this game as Blackpool rode their luck to secure the three points. 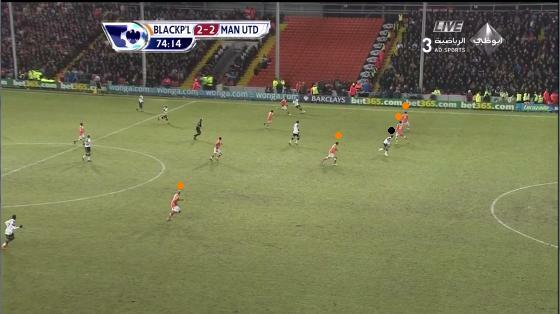 Blackpool set up as a 4-1-2-3 v 4-4-2 from Spurs. 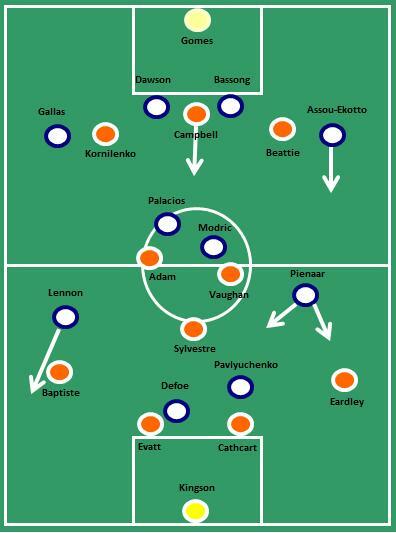 Had Blackpool set up in their more familiar 4-2-3-1 system then they may well have enjoyed the kind of success they’ve had against other teams who play 4-4-2, playing between their lines as highlighted in previous articles. However, this wasn’t the case as Holloway chose to replace Elliot Grandin with Ludovic Sylvestre in the midfield and accommodated him by inverting the midfield triangle. This meant that Sylvestre acted more like an anchor man whilst Adam and Vaughan matched up Spurs’ two central midfielders. 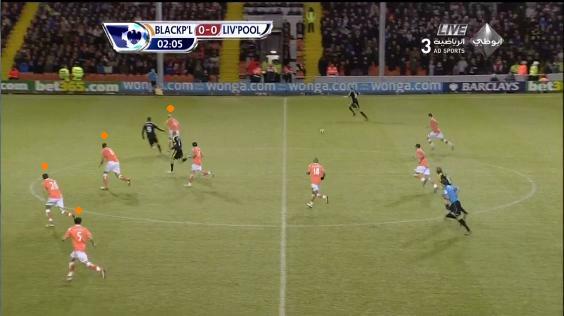 This made Blackpool’s 4-3-3 resemble something more like a 4-1-2-3. The forward three for Blackpool saw Sergei Kornilenko make his debut and link up with DJ Campbell and James Beattie. Harry Redknapp opted for a 4-4-2 and chose to go with Stephen Pienaar on the left of midfield in the continued absence of Gareth Bale, in combination with a central midfield pairing of Wilson Palacios and Luka Modric. 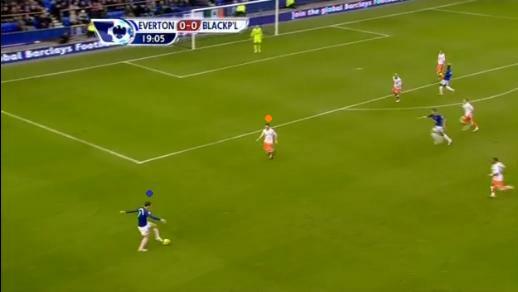 Pienaar performed the role that he played when at Everton, drifting inside to close out the extra space in midfield and cutting on to his right foot when in advanced positions. Spurs’ front two were ever so slightly staggered as Pavlyuchenko dropped a little deeper than Defoe, but in reality he didn’t create or link up play that much as Modric dictated the game through his excellent use of the ball from the deep. Blackpool had the better of the first half in terms of goals, however, Spurs looked very composed on the ball and worked themselves in to some good positions in the attacking third although their final ball often let them down. This may have been down to the change in Blackpool’s shape. Ian Holloway used Sylvestre as a more recognised anchor man and helped in stifling Spurs as they advanced on the Blackpool defence. This left Blackpool short of the more advanced option that Grandin offers, however, when DJ Campbell dropped deep to receive the ball he helped to link the midfield and attack. The first goal was brought about by a clumsy challenge from Sebastien Bassong resulting in a penalty. Whilst the second goal was a classic counter attack, Campbell received ball from deep, linked the play and eventually finished off the move. However, a combination of excellent defence from Blackpool and poor shooting ensured that Spurs’ best chances went without reward. Jermaine Jenas was introduced for Palacios at half time and appeared to have a brief to increase Spurs’ passing tempo and whilst he didn’t have the drive of Palacios’ work rate and pressure, his partnership with Modric saw Spurs move the ball around the pitch much quicker. This helped to pull Blackpool from one side of the pitch to the other and cranked open gaps in their back line which they exploited at times, but failed to convert the chances. At this stage that Spurs were in complete control of possession and in the ascendancy until the 73rd minute when Redknapp brought on Peter Crouch moving Jermaine Jenas back to right back. This saw Spurs switch to a 4-2-4 but they began to become more direct in their approach and ultimately this move lost any impetus that Spurs had. It was the Blackpool substitute Keith Southern who worked hard to pressurise the Spurs midfield and after he won the ball in the midfield a combination of poor defending and instinctive finishing saw Blackpool put the outcome beyond doubt. At Goodison Park recently Ian Holloway admitted to making poor decision for his substitutions whilst in the lead, that time he tried to change his system and got it very wrong. Here he freshened up his side and deserves great credit for utilising Keith Southern to stop Spurs’ flowing football. 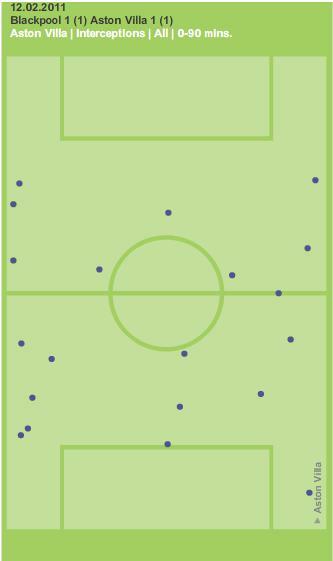 In fact Southern won all four of his tackles and was safe in possession, misplacing two of his thirteen passes. The third goal involved all three substitutes as Brett Ormerod poked home for his landmark goal. In the first half Spurs held good possession of the ball, but failed to move Blackpool’s defence out of shape. 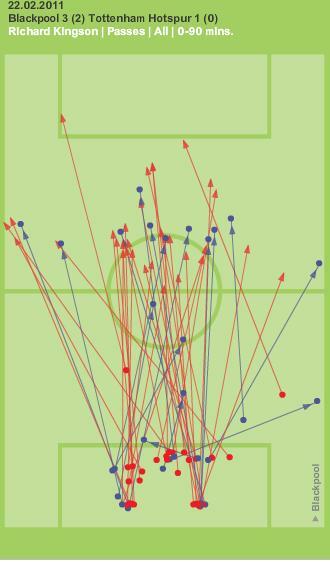 Jenas was introduced and helped to move the ball around quickly and efficiently as you can see by how many passes he had in half an hour misplacing only one. When Crouch was introduced Jenas was pushed to right back, he was solid, but Spurs seemed to lose their tempo a little and his central replacement (Kranjcar) was wasteful, shooting when a pass would’ve been a better option. Top half - Jenas in the centre helping in dictate the tempo, misplacing just 1 pass. Bottom half - He was moved to right back and Spurs lost some momentum. Blackpool struggled to play out from the back and distribution from the keeper proved to be just another pass to a Spurs player which only helped them to dominate in the passing battle. Richard Kingson was successful with only 16/48 passes. 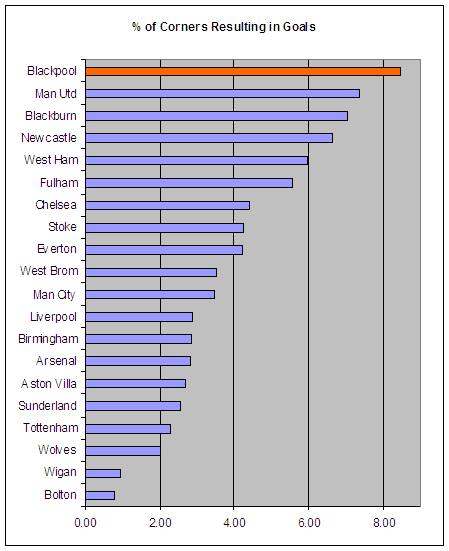 In the previous article the goal kicking had been highlighted as an issue as Blackpool’s pass completion had dropped recently. In this match Blackpool’s outfield players were much better on the ball and pass completion picked up to the 70% mark, however, it would’ve been higher and Blackpool more controlled if Kingson had been more efficient in his distribution. Streaks of red across this chalkboard as Kingson gave the ball away to Spurs. As Spurs applied wave after wave of pressure Blackpool were forced to clear time after time which they did exceptionally well 32 times out of 46 with 10 of those being made by Craig Cathcart alone who excelled at the heart of the Blackpool defence. 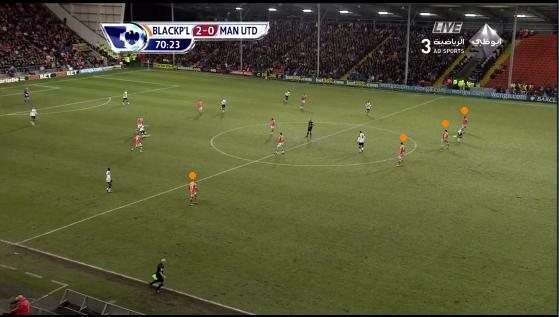 32 out of 46 times Blackpool cleared their lines relieving the pressure from Spurs. 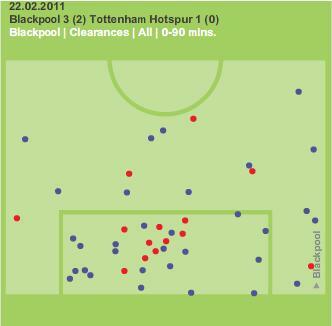 In their passing and build up play Spurs dominated, however Blackpool were clinical in front of goal, defended strongly and attacked with greater composure. Spurs will recover and go on to bigger and better things, and Blackpool take another step closer to safety. 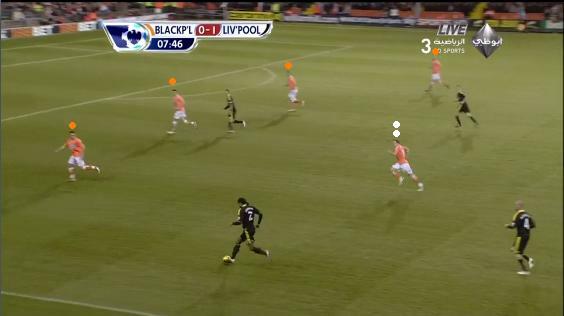 Back in January this blog took a look at the passing of Blackpool and the role that it plays in their overall game plan. Then Blackpool were on 25 points and 8 games later they have only mustered up further 4 points. This decline is on the radars of the mainstream media and the following clichés are being warmed up; ‘the honeymoon is over’ and ‘running out of steam’. However, can a focus on Blackpool’s passing help to understand more about why Blackpool have only clocked up 4 points from a possible 21 in their last 8 games? Just for clarity purposes, here is a chart showing how Blackpool’s points per game has progressed throughout the season and as you can see the line tails off towards the end as the most recent run of defeats have taken their toll. 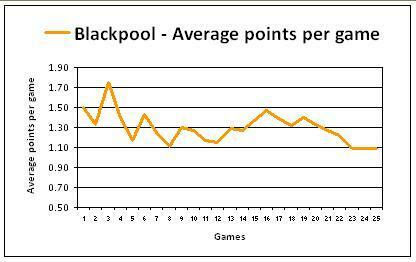 Blackpool's average points since the match against Arsenal in week 2. 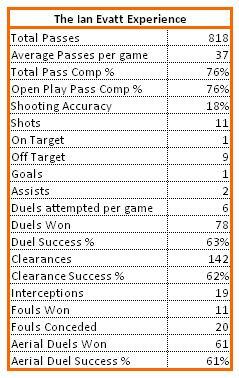 In the previous article Blackpool’s passing was picked out as a key strength and at that time they had a pass completion rate higher than Liverpool under Roy Hodgson. However, if we plot the game pass completion rates for each game on a graph, what do we see? 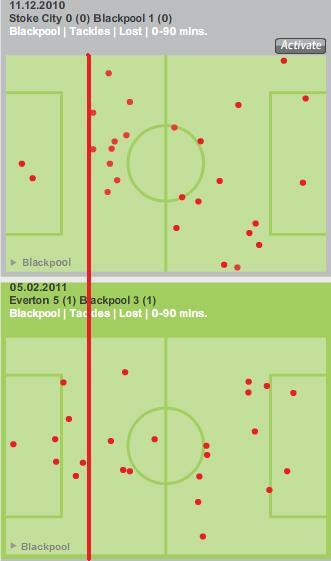 From left to right see how the line gradually tails downwards as Blackpool have completed less and less passes. 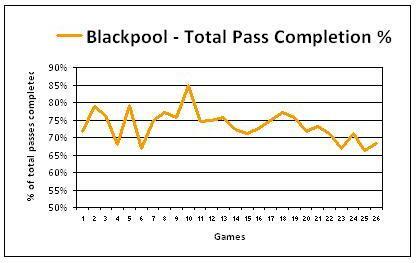 As you can see Blackpool’s pass completion has been gradually eroding in recent weeks. In fact for the games prior to their last win Blackpool’s pass completion was 75% and in the last six games it has dropped to 70%. 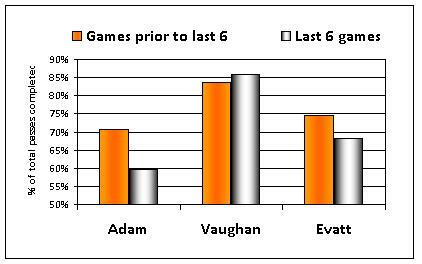 Recent articles have focused on some individual player performance over the course of the season, most recently with Ian Evatt, Charlie Adam and David Vaughan. Below is a chart showing their pass completion % for the last 6 games set against that of the games before that. 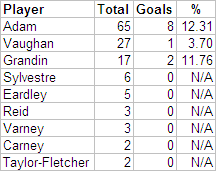 You can see above how Charlie Adam and Ian Evatt's pass completion has dropped in the last 6 games. You can clearly see that in the games where Blackpool’s pass completion has begun to disintegrate, David Vaughan has been consistently excellent, even pushing up his pass completion above 85%. Whilst Adam has dropped from 71% to 60% and Evatt has gone from 68% to 75%. 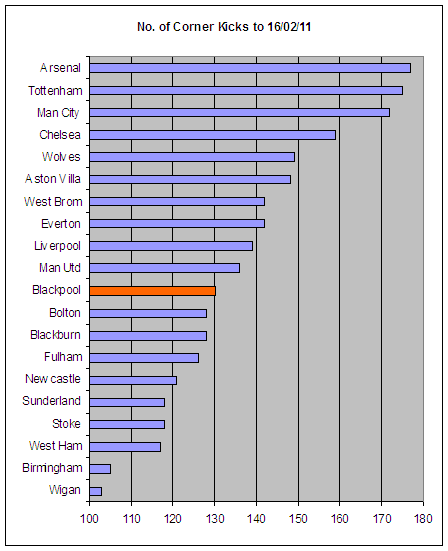 This tends to fit in to the fact that Blackpool’s pass completion has started to drop for two key reasons. Team putting players under more pressure by closing them down and that Blackpool’s players are still learning to improve their decision-making at this level i.e. when to pass and what pass to make. For example, teams seem to really pressure the back line and the keeper now, in order to make it harder for them to play out from the back. This is further backed up when looking at the completion rate for goal kicks. In the last six games it has dropped to 57% from 64% previously. Earlier on in the season goal kicks were often taken short, however, forwards are alert to that threat now and seek to cover the edge of the area making interceptions and forcing passing errors. 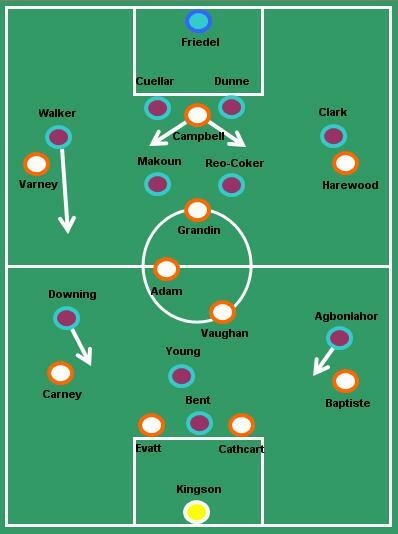 See the chalkboard below from Blackpool’s most recent game against Aston Villa. 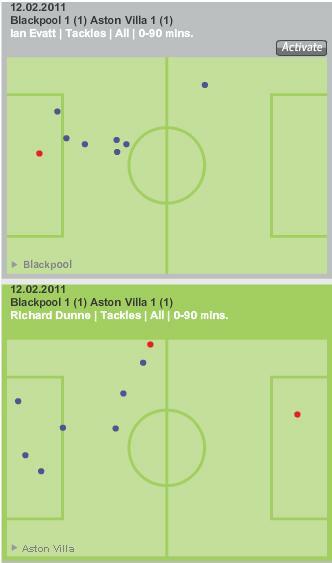 Notice how 9 of the 20 interceptions made by Villa were in Blackpool’s own half. 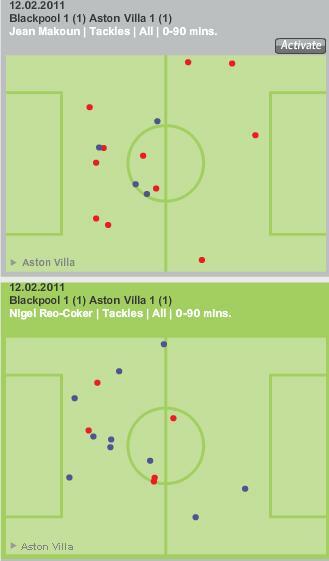 As Villa pressed Blackpool they made 20 interceptions, 9 of them in the Blackpool half. This week Ian Holloway has talked about how he wants to learn from Josep Guardiola to improve his side. It is possible that he feels he can learn to improve his side’s ball retention by seeing how Barcelona play and that this learning could well be applied to allow his side to pass the ball better under pressure, improving their pass completion and possibly win more games. On average, in the games that Blackpool win, their pass completion is 1% higher than those they lose. Small margins on the surface, but at the top-level of football, small margins might make a big difference especially as Blackpool try to stay in the Premier League. This game turned out to be a fair result as both teams had chances to score more than the one goal a piece. Both managers threw very few surprises in to the mix as tactically this was a very plain game. 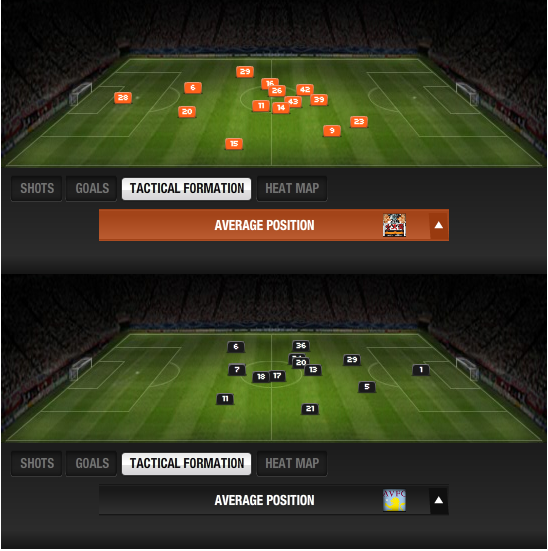 Villa more defintion between defence and attack. Blackpool more of a blended approach. From a formation point of view this was 4-2-3-1 v 4-2-3-1, however, they were applied slightly differently as Gerard Houllier prefers to have his two midfielders sit deeper and hold their positions. On the other hand Ian Holloway likes a balance of defence and attack from his two with David Vaughan more likely to sit and hold. A flex in the Aston Villa side was the movement of Ashley Young and Gabriel Agbonlahor, which sometimes gave them the look of a 4-4-1-1. The latter was deployed out left, but would make runs wide and inside and Young would often move to support Darren Bent in attack. Finally, Kyle Walker was given permission to attack and he did so at speed, however, at times his runs would be on the inside and he ran in to the more congested central areas. The first half saw both team have chances, Villa looking to counter and using Stuart Downing to great effect on the right cutting in on to his left. However, the Villa goal was a familiar sight for Blackpool fans as the Blackpool defence was caught out of position whilst the game was in transition. A good link up between Bent and Agbonlahor exploited the vacant right back area after Alex Baptiste had been high up the pitch involved in an attack. David Vaughan found a lot of space at times, especially if Ashley Young didn’t track back and as Houllier persisted with two deep midfielders Vaughan started to take control of Blackpool’s passing and played some good balls in to the channels, he only misplaced 4 passes from 48. 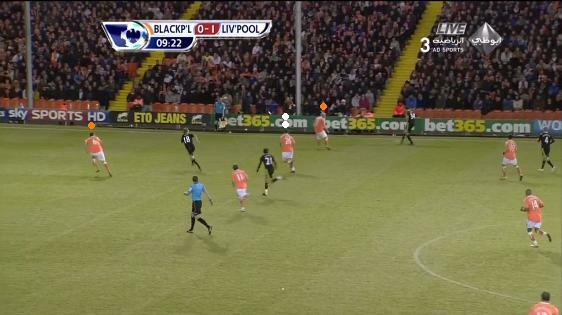 The Blackpool goal came from what is also becoming a familiar sight for both teams, a goal from a corner. According to Opta before this match Blackpool had scored the most goals from corners in the Premier League, whilst Aston Villa had conceded the most. The second half saw both teams get in to good attacking positions, however, Blackpool were the team that retained the better possession and created the most chances. Blackpool seemed to hesitate in making decisions in the final third and often looked unsure of what to do and their shooting seemed to reflect that (the goal being the only time they hit the target). After a red card saw Jean Makoun depart Villa switch to a 4-4-1 looking to hit Blackpool on the break, but in truth, both centre back partnerships looked very solid indeed. Whilst Blackpool had Elliot Grandin on the pitch they looked more fluid going forward, this in part may have been something to do with his efficiency with the ball, misplacing only one pass before his injury. Jason Puncheon came on to play that role before Andy Reid came on and in to the role on 72 minutes. The chalkboards below show how Grandin performed in the role much better than Puncheon. Puncheon in the midfield, before being moved wide left. Gerard Houllier persisted in playing to holding midfielders, however, the chalkboard below showed how only one of them (Reo-Coker) was effective, leaving questions over having Jean Makoun on the field at the same time, where a more attack minded midfielder might have given Villa more options in the final third. You can see how Makoun only won 4 of his 15 duels whilst Reo-Coker won 10 of his 15. Two holding midfielders really necessary? After both goals were scored the game was characterised by Ian Evatt and Richard Dunne dominating the game and helping to snuff out the attacks. See their chalkboards below. Evatt lost only one duel all afternoon, whilst Dunne lost only 2 of 9 and those that he lost were outside of any danger zone. Big strong centre backs gave the strikers little change. The result was fair for both teams, Houllier might look at changing his approach in making one of his holding midfielders more progressive and the substition of Michael Bradley might offer him that in the coming weeks. Ian Holloway will be happy to move on to the next game with plenty of time to train up his side and get them motivated for the Spurs game on the 22nd February. An all-action eight goal thriller. Blackpool continue to provide more bang than their buck in the entertainment stakes, but it’s hard not to yearn for a scrappy 1-0 win. ‘Pool slid to their fifth consecutive defeat at Goodison Park and while Ian Holloway’s men continue to rack up the goals, a defence leakier than the Welsh national emblem means survival is starting to look trickier by the week. The Seasiders bounced back from poor first half performance to take a stunning 3-2 lead, only to collapse under the weight of endless Everton pressure. Blackpool endured a tough opening 45 minutes and were highly fortunate to go in at half-time with the scores level at 1-1. Everton were rightly furious at the decision to blow for a foul on Seamus Coleman just before half-time, seconds before Louis Saha went on to bag what should have been his second goal of the game. Tangerine Dreaming has identified Marouane Fellaini’s impact in stifling ‘Pool’s midfield in the first half, in particular Charlie Adam. What else caused the Seasiders to struggle though? The chalkboard below compares the number of successful passes in the first half at Goodison Park against those made in the previous match versus West Ham. By all accounts it was hardly a scintillating first half against the Hammers last week, but the number of successful passes still dwarves the figure from Saturday’s game. ‘Pool only completed 114 passes in the opening 45 minutes, a startlingly low figure. A failure to hold onto the ball and make it work for them handed the initiative to the Toffees who exploited Blackpool’s defensive frailties on numerous occasions. Nowhere is this issue more pronounced than in an examination of Paul Rachubka’s chalkboard below. For many, the return of Rachukba between the sticks was a welcome sight, following a string of error’s from Richard Kingson. However, while none of Everton’s five goals can be directly attributed to Rachubka, Holloway must be concerned with his distribution. The USA born goalkeeper managed to find a tangerine (or white, in this instance) shirt only four times out of 21 attempts in the first half – a woeful 19% completion rate. Also noticeable is Rachubka’s failure to play the short ball even once. 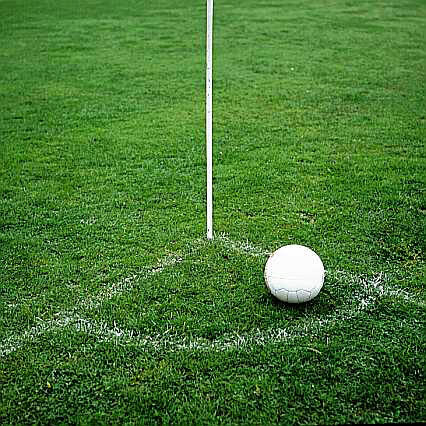 A key facet of Holloway’s system has been to play the ball out from the back, but by opting to go long so frequently, ‘Pool gave the ball away cheaply. In the second half Rachubka managed a more respectable 50% pass completion rate, but still opted to go long more often than not. Rachubka may be less accident prone than his Ghanaian counterpart, but unless Holloway can train his number 1 (in squad number terms) to make the angle for the short ball, he may quickly find himself back watching from the sidelines. Blackpool suffered an early set-back almost immediately after the break, but thereafter enjoyed their best spell of the game. 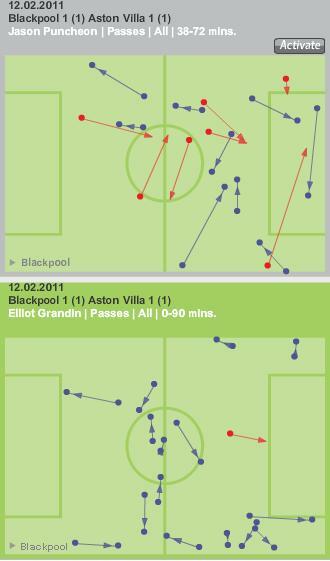 Elliot Grandin and Jason Puncheon began to combine well, with Blackpool’s counter-attacks testing, and overcoming, Everton’s defence. Holloway now has a variety of forward options and Puncheon impressed on his debut, getting into dangerous forward positions and causing problems with his pace. 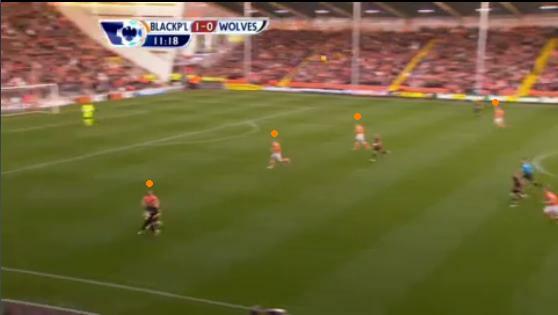 At 3-2, the momentum was with Blackpool, but the scoreline presented Holloway with a dilemma. So often ‘Pool have forfeited winning positions, with different strategies all failing at various times. Against Man Utd, Holloway sought to continue to attack, throwing on both Matt Phillips and Marlon Harewood. As we all know, that strategy backfired as the team from Salford turned the game on its head with three quick goals. Holloway tried to emulate the win over Everton’s city rivals by packing the defence and midfield, but as Tangerine Dreaming points out, it resulted in handing Everton the advantage – Pool’s defence was at sixes and sevens despite their superior numbers. It is a decision easy to criticise in hindsight, and one Holloway must surely regret. Positive changes, or even keeping things as they were could have seen ‘Pool return with at least a share of the points, if not all three, but ultimately defensive lapses have cost the Seasiders again. There are enough positive signs in Blackpool’s attacking ability to retain hope, but the failure to strengthen the defence despite Dekel Keinan’s departure could come back to haunt the Seasiders.